You’d think Big Walnut would want to put last year’s 2-8 season out of its mind for good. The thing is, though, the Golden Eagles learned a lot about themselves during the stretch … things that will almost certainly help them this time around. “What I learned about this team last year is it’s a resilient group,” BW coach Joe Weaver said. “It’s easy to pack up shop when things aren’t going your way. The thing I’m most proud of, though, is my kids didn’t do that. They showed up everyday with the will to get better. They poured their guts into it and just kept grinding. Part of the reason Weaver knows last year’s lessons won’t be lost on this year’s group is because it’s headlined by an experienced senior class with an abundance of leadership qualities. Weaver said he has so many leaders, in fact, he and his team couldn’t come up with just three or four captains. “I sat down with my seniors and we talked about captains,” he said. “One of the issues was they are all very unique in their own leadership qualities. Some are good vocal leaders, some are good leaders by example, some are good leaders off the field. The Golden Eagles have position battles all over the place, as all teams do this time of year. One such battle is at quarterback. Senior Tyler Ronk (6-0, 200 pounds), who started most of last season, is back in the fold. Senior John Sutton (6-0, 185) is back, too, eager to get under the bright lights of Friday nights after missing almost all of last season due to injury. Sutton started six games as a sophomore, but suffered an injury requiring season-ending surgery in Week 1 last year. No matter who is behind center, they’ll have some experienced guys protecting them. Seniors Caleb Pierce (6-3, 300), Tanner Daniels (6-2, 250), Curtis Bowmar (6-3, 250) and Noah Mason (5-11, 235) all return with varsity experience. Others who will provide depth on the line include senior Trevor Shuster (5-11, 215), junior Holden Williams (5-11, 250), senior Luke Apple (5-10, 210), junior Josh Hageman (6-1, 180), junior Wes Coey (6-3, 200) and sophomore Logan Lang (6-3, 225). The running backs will again play a big role in the Big Walnut offense. It’s a stable that includes seniors Matt Priestas (5-9, 170) and Abe Myers (6-2, 220), juniors Andy VanHouten (5-9, 175) and Jimmy Gianessi (5-10, 150) and sophomore Tyler Crotinger (5-11, 180). Those expected to make plays from the receiver position include seniors Colin White (5-11, 170), Jackson Seiple (6-1, 185) and Corbin Willison (6-3, 185), juniors Sam Elliott (6-2, 185), Ian Taylor (5-11, 160) and Dante Chhuom (5-8, 140) and sophomore Craig Norman (5-10, 155). Juniors Eli Myers (6-3, 225), Nate Lawyer (5-11, 210) and C.J. Rockwell (6-2, 220), meanwhile, will look to make plays at tight end. Weaver said his guys have what it takes to put together a successful season … they’ll just have to maintain it from start to finish. “I want a consistent fire,” he said. “We have some experience in good spots and youth in others. We need some guys to mentor some kids pretty quick and get them ready to fulfill their new roles. I just want them to play with that fire. Things are going to happen and we have to respond. The defense will have a similar look to the offense in terms of personnel. Pierce and Shuster return to the defensive line, with sophomore Max Lenz (5-11, 200), Rockwell, Coey, Daniels and Eli Myers expected to push guys around in the trenches as well. Abe Myers is returning at linebacker, as are Apple and senior Brandon Mosher. Lang, Hageman, Elliott and Lawyer will also fly around close to the line of scrimmage. Weaver said he expects guys like Seiple, White, Chhuom, junior Clayton Bell (5-9, 140), junior Mitchell Truax (5-9, 145), Taylor and Ronk to make plays in the secondary. 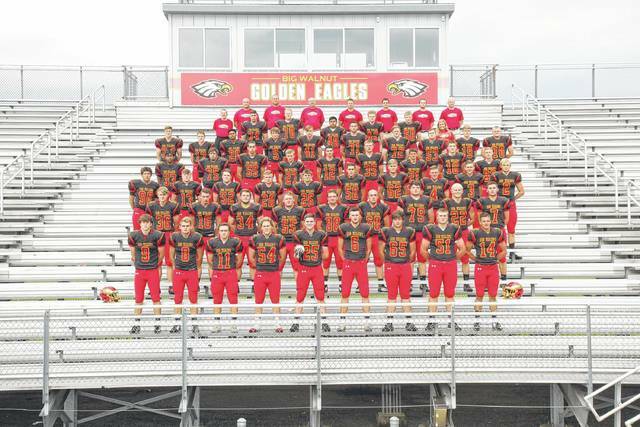 The 2017 Big Walnut varsity football team.